This year’s Chelsea Flower Show seemed to mark a return to horticulture, rather a relief after the show becoming increasingly dominated by sculptural assemblages (I’m trying to be polite here) or flocks of statuary. A lot of the gardens were just well planted, with a refreshing lack of pretentiousness. Andy Sturgeon’s winning Mediterranean Garden (for The Daily Telegraph) was a model of all that is best about British garden design – the classic balance between strong structures and exuberant planting – but all in a very contemporary style. No cow parsley though. I’d like to put in a bid to do a cow parsley garden. Queen Anne’s Lace to American readers (I think). This cream-white flowered umbelliferous plant dominates a vast proportion of British roadsides, seemingly able to compete with the grasses which, fed on nitrogen pollution, more or less suffocate the rest of our limited wildflower flora. In my last garden, I conducted an experiment in letting it seed one year, and then controlling by pulling up after flowering. It worked, in that I got a respectable amount of cow parsley but without it competing with anything else. So, now I’m repeating the experiment here. What I like about cow-parsley is the delicate flowers and, because it is such a common element of the British countryside, brings the landscape into the garden. The colour is also a buffer, toning down and blending the brighter colours of border plants. In theory I’d be quite happy for the stuff to distribute itself around the garden, but only if it isn’t going to become a weed and out-compete my border plants. Cow parsley (Anthriscus sylvestris) is a biennial which survives year to year by seeding and apparently (though I have not verified this myself) by the production of bulbils at the base of the plant. It has a very narrow profile, doesn’t spread sideways or sprawl about, and dies from July onwards. Not something which could become a major problem then, and its reproduction can be controlled by pulling out before it seeds. Welcome to the naturalistic border! Doing a lot of teaching this spring. 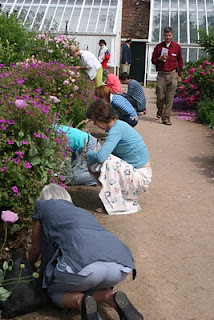 Groups of keen gardeners, garden design students or practising designers. 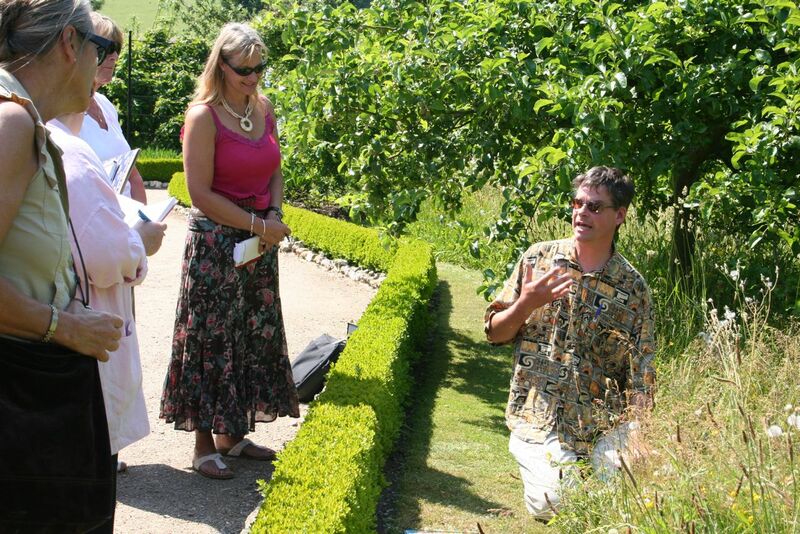 English Gardening School, Society of Garden Designers regional groups, that sort of thing. Great fun, and terrific response from students. I love it. As for “teaching”, anyone who has to face a class of 30 inner-city kids five days a week is entitled to turn around and ask me to use a different verb – everyone is so keen and so appreciative. And always learn stuff from my groups as well. But they’ve got to get onto their hands and knees. You can’t observe plants from standing up. At the Hillier Arboretum, I have divided a group of 30+ up into groups of 4/5 to select plants to describe in their immensely long Centennial Border, “get on your hands and knees” I have to shout at some of them – this is where the sensible types get sorted out from those who brought unsuitable shoes or are afraid of tearing their tights. At least British students will work in groups. Did that with a group of mostly Chinese at Sheffield University once; as soon as you go to talk to one group they all sneak up behind you, and you turn around to see the entire class – ‘the teacher as the fount of all knowledge’ is so fundamental to them, which it isn’t to us. I studied adult education when I was teaching English as a Second Language back in the 1980s. The current dogma then was that a much as possible should come from the students, which is actually good, as it empowers classes and makes for a good interactive atmosphere. You don’t get a chance to nod off in my classes, there’s too much expected of you. and will try to make repeat visits through the year. It’s one of those places which feels timeless: lots of big old trees, walled gardens, box-lined beds and paths which lead through a pleasantly bewildering variety of spaces, just full of wonderful plants. This is the perfect ‘plantsman’s garden’, lots of rarities, often very well-established, and very thorough labelling. You can just wander around, at random, crossing and re-crossing your previous routes through, getting different perspectives through the trees, continously finding little nooks and crannies. It is something of a miracle how the staff of four keep on top of it all, and it has to be said that a bit of an atmosphere of faded grandeur is all part of its very characteristic feel. Owner John Berkeley was one of my customers when I had my nursery north of Bristol many years ago, as head gardener Kate Portman said to me, “I think he knows every nursery in the country”. There are some wonderful plants here, and some lovely combinations. What is particularly interesting is seeing sizable and very well-established examples of garden plants, the most spectacular being what must hundreds of square metres of partially-shaded lawn invaded by self-sowing Lilium martagon. A total absence of modern design ideas or self-conscious fashion gives this place real character, and a very restful feel. Just as well, as any plant-conscious gardener is also going to be very excited by so much of what is growing here.